I joined a book club this year — 4 books, 4 evenings with great desserts — led by Paul Doerksen, teacher at Mennonite Brethren Collegiate Institute, here in Winnipeg. On the menu tonight is Atheist Delusions: The Christian Revolution and Its Fashionable Enemies by David Bentley Hart. It’s been a slog, frankly, reading this book, but that’s why one joins activities like this, I suppose — to persist in what’s good for one, not just the dessert! 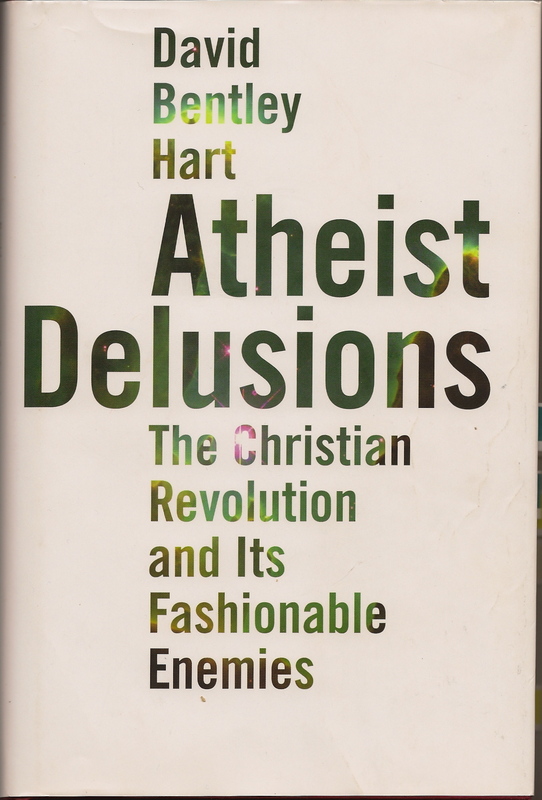 Hart takes on the current atheist apologists, none of whom I’ve read, and also considers in some detail the first four or five centuries of Christian history, with which I’m also not as familiar as I probably should be. Hart’s style is as vigorous and compelling as it is complex, and he has a magnificent capacity for what seems to me a kind of (usually) holy sarcasm. I’m tempted to quote him endlessly here, but first I want to hear how Paul Doerksen will pull Hart’s thesis together — he’s read the book at least twice — and what the rest of the participants of the group will have to say. This entry was posted in Books and tagged atheism, Christianity, David Bentley Hart by doradueck. Bookmark the permalink. I spent the better part of a year and a half slogging through the new atheist corpus for a master’s thesis. I finished about half a year too soon because I would love to have incorporated more David Bentley Hart into my critique (especially around points 1 & 2 you identify above)! Some of the most entertaining reading I did in response to Dawkins & Co. flowed from Hart’s pen, although mainly in essays and blog posts (e.g., Daniel Dennett Hunts the Snark ). He certainly has a way with words, and his sarcasm (holy and otherwise) is a welcome response to both the character and content of the new atheist screeds. I will certainly have to pick up this book (too bad your club is a couple thousand km away!). I know that you will certainly like this book, and probably whiz through it too! What is the title of your master’s thesis, by the way? Well, I don’t know about whizzing through it. Usually when I read David Bentley Hart I need to have a dictionary pretty close by :). When you showed me the book I said I don’t have time to read it, but on reading your review I think I must. I hope you’ll either post or stop in at the office to tell me about the conversation with Paul and company.